Hey friends, it’s time to update one of my older (but still awesome) posts! This one was originally posted in June 2013, so I updated the text, images, and schedule, and added new planning sheets. Happy training! The New Year often brings with it new goals for fitness, and the beginning of the year was one of my favorite times to create a race plan for the year ahead. While I have to take a break from running for a while due to an injury I’ll need surgery for, when I was training for a half marathon, this blank training schedule was one of my favorite ways to track my running mileage. It’s a quick at-a-glance way to see where you are in your training! Because I loved to do so many things (weight lifting, rock climbing, hiking, cycling, etc. ), it was hard for me to find a running plan that fit my needs. So I created a blank race training schedule that I could customize and make my own! This blank race schedule is basic and meant to be an at-a-glance tracker for mileage. It’s isn’t meant to have places for a lot of detail, which is why you’d want a bigger running journal or notebook to track your training details (like fuel choices, how you were feeling during your workout, etc.). Our schedule is perfect for hanging on your fridge since it’s compact and you can see everything at once, which I love! I love details, but I also love to see the big picture, and monthly calendars are invaluable to me for that reason. When I was training for races, I’d hang this schedule on the fridge and fill out my miles each day and week. 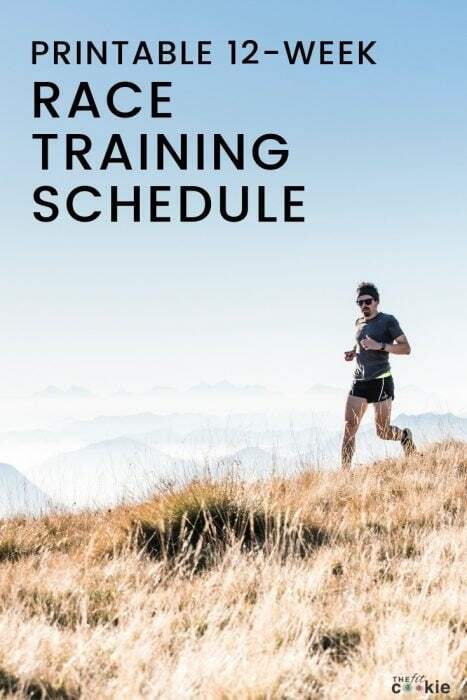 You can also use this race training schedule for triathlon training at a glance, swimming, biking, running, or anything where you need to write out your weekly distances. If you need a longer schedule, print out 2 of these and re-number them! 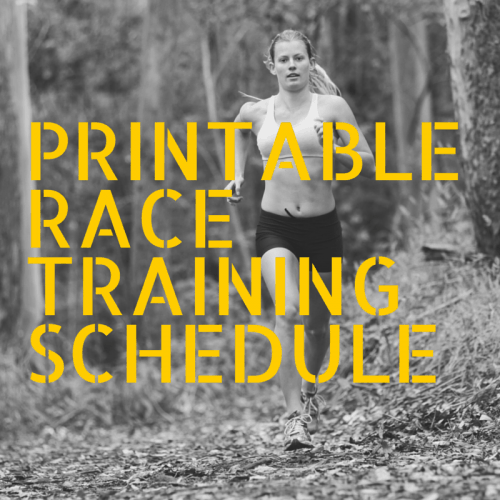 The race training schedule looks like the one below, just click the link below to print or download it. 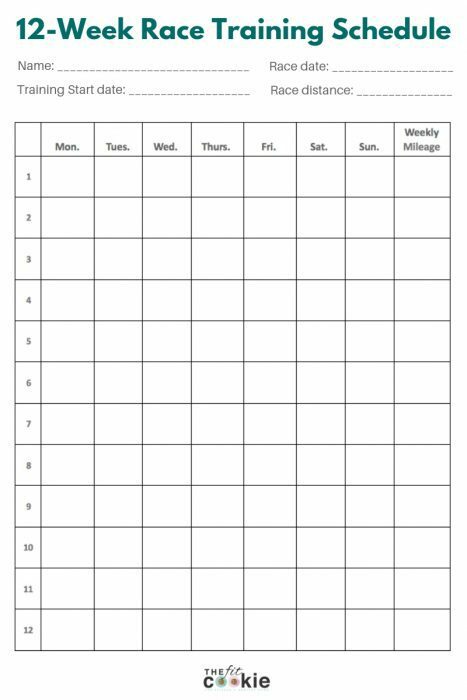 I’ve also added new printable 6-week goal setting sheets as well if you want these to go with the schedule! You can print those below by clicking on the link or the image. love this! pinned it and will use it for future! Thanks for sharing! That’s a great spreadsheet. 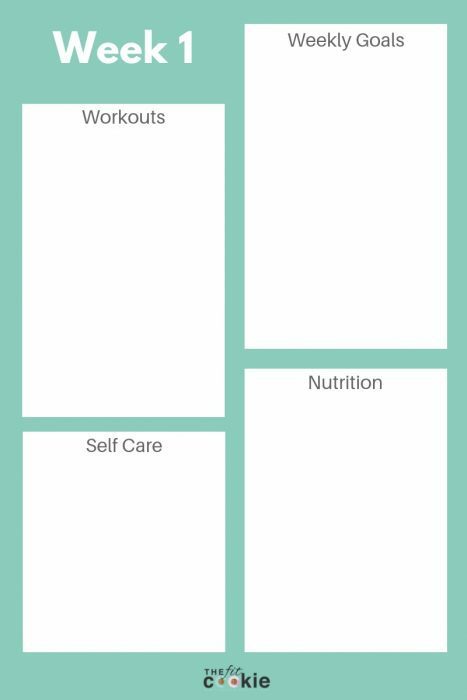 I like to have room to schedule strength and yoga workouts too. Now aren’t you helpful!!! 😀 My training/exercise is so ingrained into my head that I don’t need a calendar for it though, lol… I am what you would call… A FREAK – lol!